Pio Monte della Misericordia (Pious mount of mercy) is a charitable organization founded in 1601 by seven young noblemen in Napoli. Every Friday they met at the hospital to minister to the sick. 400 years later, the organization is still in operation, assisting minors at risk, those struggling with addiction, unaccompanied migrant minors, disadvantaged families, the homeless and the terminally ill. 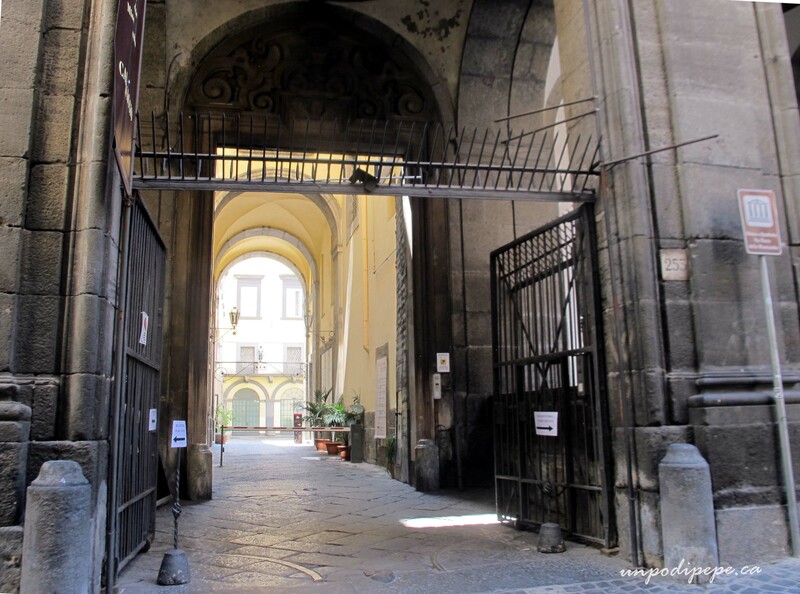 In 1602, the founders commissioned a small octagonal church on Via dei Tribunali. They wanted artwork to express their sense of charitable mission, which was guided by le sette opere di misericordia, the seven corporal works of mercy. These are a set of compassionate acts concerning the material needs of others, based on the bible passage ‘For I was hungry and you gave me something to eat, I was thirsty and you gave me something to drink, I was a stranger and you invited me in. I needed clothes and you clothed me. I was sick and you looked after me, I was in prison and you came to visit me’ Matthew 25:35:36. Bury the dead was added later and comes from another scripture. They hired, who else but Caravaggio to paint one of the seven works of mercy for the altar of each of 7 chapels. Caravaggio was either in a big rush or feeling like a challenge, because he incorporated all 7 onto 1 canvas! The capolavoro is one of the most important of his works, and of the 17th Century. It still hangs in its original position above the high central altar! 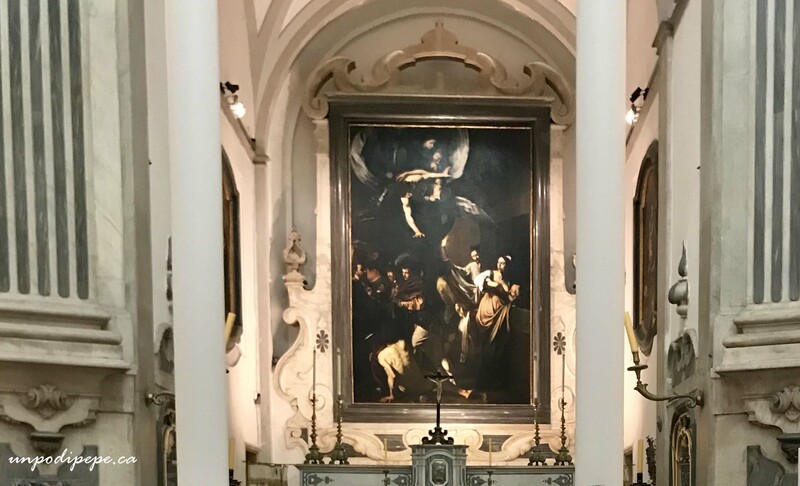 Seven local Caravaggio followers, including Luca Giordano, Fabrizio Santafede and Battistello Caracciolo provided paintings for the chapels. The composition is realistic, complex and dramatic. At the top of the painting, 2 angels are supporting the Madonna di Misericordia and child in the air. The bottom half features figures carrying out the acts of mercy. On the right, from the myth Roman Charity, Pero secretly breastfeeds her father, Cimon, after he is imprisoned and sentenced to death by starvation. (feed the hungry and visit the imprisoned). Behind the wall of the prison, 2 men carry a shrouded body with the feet dangling out of the blanket (bury the dead). On the left, St Martin de Tours comforts the injured beggar in the foreground (comfort the sick). He tears his cloak and gives half to the naked beggar (clothe the naked). In the background, a pilgrim with a shell in his hat asks an innkeeper for shelter (shelter the traveler) and behind them, Samson drinks from the jawbone of a donkey (give drink to the thirsty). All of this action is taking place in a dark, mysterious vicolo, an alley that could be just around the corner. Caravaggio uses his signature strong contrasts of light and dark chiaroscuro, the bright light acting as a metaphor for mercy. 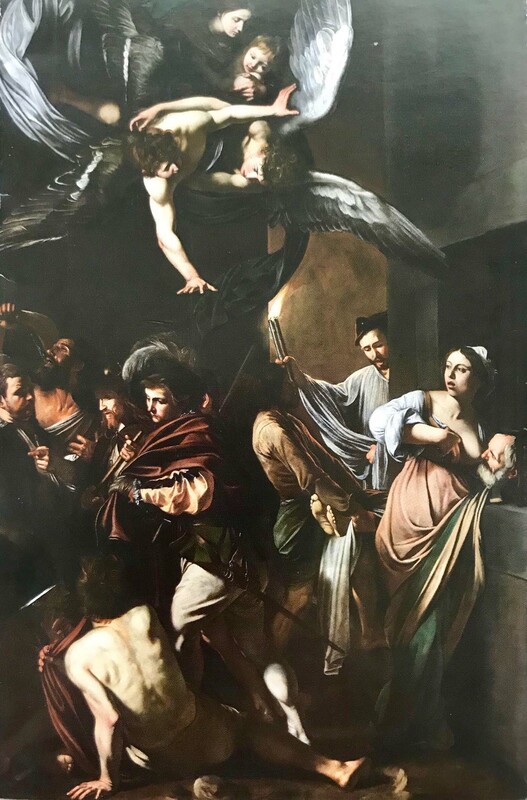 Caravaggio came to Napoli with a price on his head, on the run from a murder charge. He was idolized and successful in Napoli, but he was desperate for a pardon, so after only a year, he left Napoli for Malta where he thought the Knights of St John could help him. This may explain his decision to incorporate all of the works of mercy into one painting! As discussed in this post, it has also been confirmed that he had lead poisoning. Caravaggio understood Napoli like no other painter and had a profound influence on the artistic scene in the city for the next few centuries. He left behind a lot of followers-the Caravaggesque movement. Images: Scan of Le Sette Opere di Misericordia taken from the Pio Monte della Misericordia brochure. 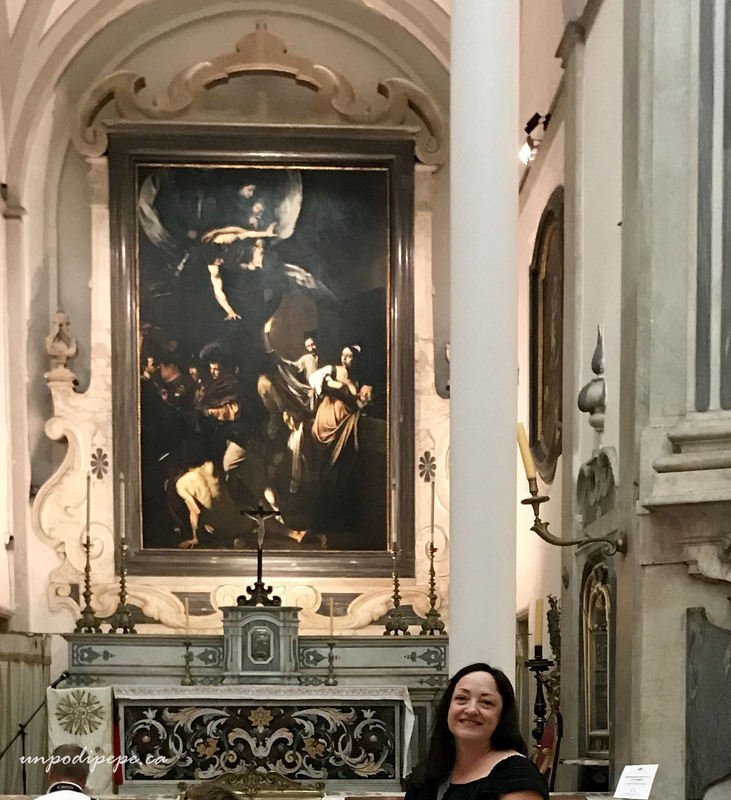 Photo of me with the painting taken by another visitor to the church. He said I looked so excited he had to take my photo! I agree with Susanne. That was so interesting and your explanation adds another dimension to the extraordinary painting. lovely pic of you with the painting! Grazie mille! This is such an excellent post. I am familiar with the painting, but I regret to have never taken the time to understand it in its entirety. I am grateful to your for this in-depth explanation. Quite fascinating. I have tweeted it in hopes to share this valuable information. Saluti! Wow, that’s a lot going on in one painting, but the amazing thing is that it isn’t cluttered at all. Good story and excellent picture of you with the painting!